What a trip! It was GOOD when it was good, and when it was bad...boy, it was BAD! Last week we spent 4 days and 4 nights in San Jose Del Cabo Mexico, which was awesome! :) We also spent a night on the floor of the baggage claim in the Philadelphia airport, which was not so awesome... :( Needless to say, it was a trip full of highs and lows--none of which I would trade. Well, okay, maybe I would trade a couple of the lows, ha ha. Especially the part where my first marlin threw the hook--OH! And then there was the windshield of our plane shattering mid-way through our flight into Cabo... yeah I'd trade that one for sure, lol. Still, we left Mexico with some awesome memories. None of us had been to Cabo before, and the scenery was breathtaking. There is something awe inspiring about steep desert mountains adjoining the deep blue of the Mexican Pacific and the Sea of Cortez. The area is boiling with an abundance of wild life... We saw pelicans, whales, sea lions, porpoises, some awesome types of fish (like flying fish) and we even caught a few fish as well. Unfortunately for me, this was the closest we came to catching in a marlin in the two days that we fished. We saw two other fish but neither one of them w as willing to bite. Still, on day two of our adventure, we found another type of fish to chase... TUNA! 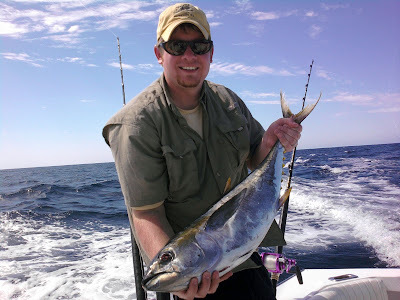 Neither Marianne nor I had ever caught yellowfin tuna before, but boy did that change on day two of our trip. We started out the morning heading offshore in a different direction than on day one. The morning started off with us watching an enormous humpback whale launch himself almost completely out of the water, twist in the air, and crash back into the water with a colossal splash--our day was already a success! We continued motoring farther offshore until captain Ramone found a giant school of porpoises, who were feeding on flying fish. Fernando dropped back our trolling lures, and within seconds we were hooked up with yellowfin tuna. Apparently the tuna were traveling along with the school of porpoises. The action continued for about an hour, until Marianne and I had had enough. At times porpoises surfed in the waves next to the boat while we were both hooked up to fish, and at least one other rod was bent over screaming in the rod holder. In the end, we landed 13 yellowfins... and we were pooped! We finished up day two relaxing, and trolling for marlin on our way back in... We didn't have any further luck, but we did sight one marlin who wasn't willing to bite. Still, it was an awesome day and I couldn't have hoped for anything more. Later that night, Marianne, Tillie, and myself went out to a nice local restaurant in San Jose. We brought along a couple pounds of fresh caught yellowfin for the chef to prepare for us. We didn't really know what to have him do with the fish, but we just hoped that it would be good. Fortunately, we did not leave disappointed. In fact, the chef prepared for us a feast that we all agreed was probably the best meal of fish we had ever eaten. It started out with a dish of sashimi, as an appetizer, which was just incredible. Then the main course came as pan seared tuna steaks, flavored with many different seasonings... I really don't know how to describe it other than to say it was spectacular! I'm getting hungry just thinking about it. The remainder of our trip consisted of a lot of much needed relaxation... Hanging out on the beach, getting sun burned (some of us more than others... ha ha), reading books, eating food, drinking drinks, and a little bit of fishing from the beach by the resort (without much luck). After 4 days of Mexico, we didn't have enough at all and all three of us were reluctant to head back home. Still, in this world, most good things eventually come to an end...and such was the time we had allotted for our trip to Mexico. Our plane ride back home was without incident, until we arrived late into Philly airport and subsequently got stuck on our plane for an hour--missing our last connecting flight to Harrisburg. Henceforth, we enjoyed the previously mentioned "fun-filled" night spent in baggage claim; before we were able to catch our short connecting flight back to Harrisburg the next morning. As I mentioned before, it was--without a doubt--a trip filled with highs and lows, and--without a doubt--the highs outweighed the lows. I hope someday to return to Los Cabos and feast my eyes on the highs of the rugged desert mountains and drink up the lows of the beautiful Mexican Pacific. Until then, I have memories... Good ones.